A Inspection Of The Roof Will Inform You On The Conditions, Minimize Any Costly Repairs And Assure The Contractor Did It Right. Roofing Specialist Both Residential & Commercial. Examine All Aspects Of The Roof Structure, Surface Material, Flashings, Etc. Assure Works Where Undertaken By Today’s Roofing Standards & Code Compliance. Pacific West Building Inspections provides roofing consultant services such as roof surveys and on-site roof construction inspections. We offer roof consultation throughout British Columbia. We provide visual rooftop surveys and inspections on all types of roofs old or newly installed. 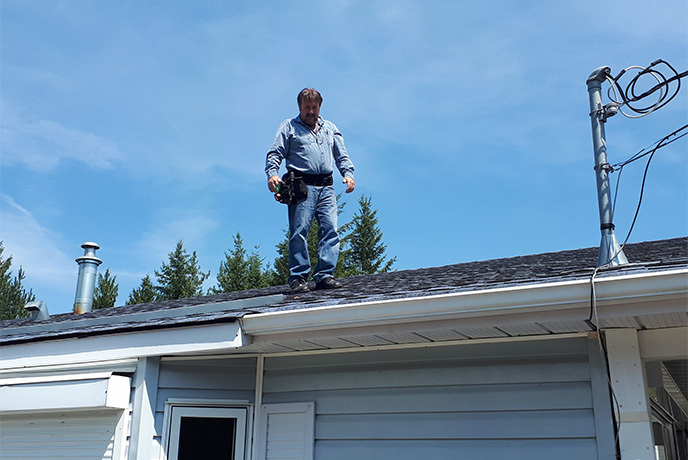 We’ll determine the condition of the roof, what type of services are needed whether it be maintenance, repairs or replacement and we include estimated budget figures. We also inspect newly installed roofs to assure that the building owner/s that the contractor had installed and applied the new roof covering and related flashing/sealants according to industry standards, best practice, and code requirements. We recognize the value to our clients that independent on-site roof inspections are important and are a vital aspect of all roofing projects by providing an inspector during the installation of the roof covering, you can be assured that the work was undertaken according to industry standards, best practice, and code requirements. You can be assured that roof covering will perform its intended function for many years of its lifespan through normal weathering.